I have a confession. 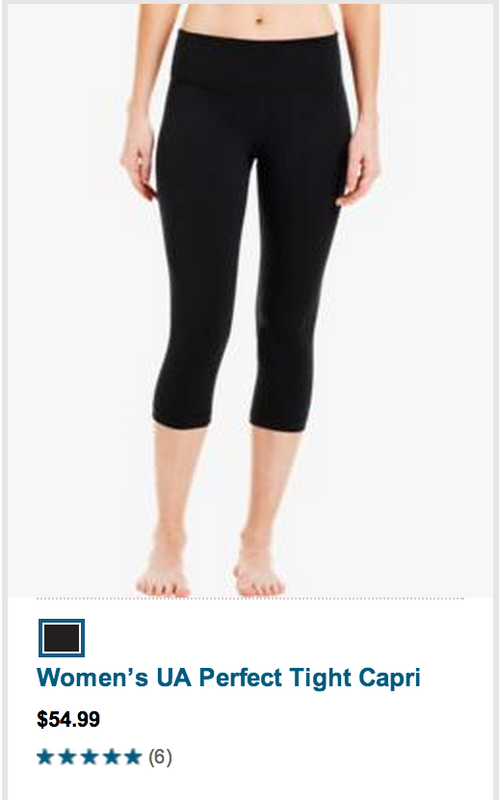 I have not purchased new work out clothes in well over a year. How I’m still able to wear my workout gear without scarring society is beyond me. I have another confession. 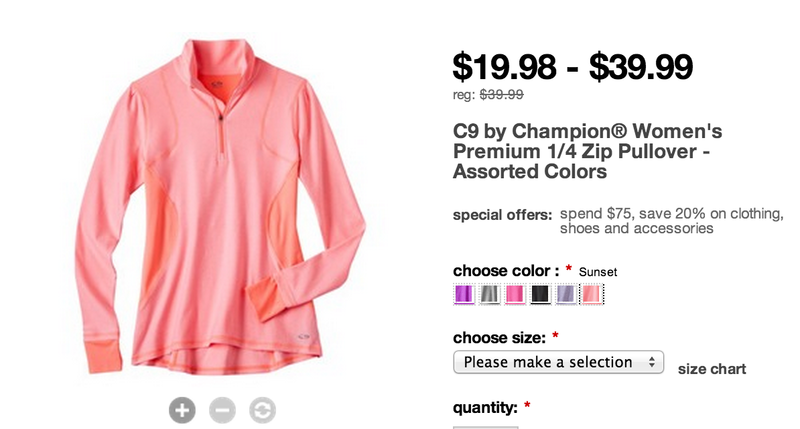 I will probably not purchase new workout gear for at least another two months. It’s just not feasible at the moment. So what am I doing in the mean time? 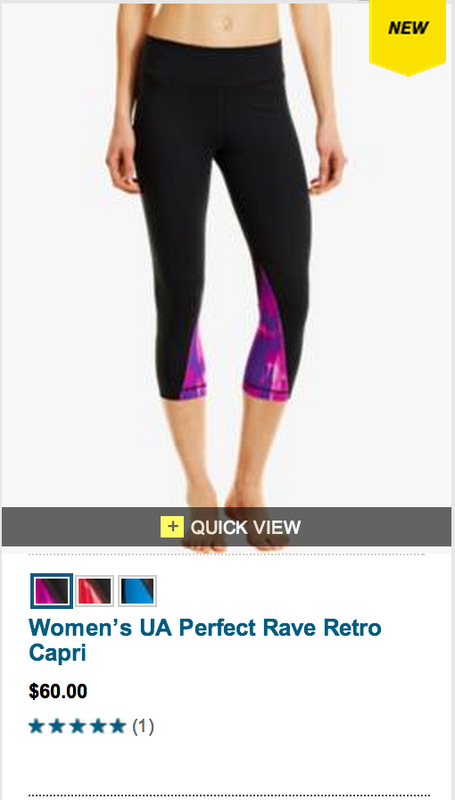 Drooling over these various capri length workout pants and tops and accessories that I must have or I will probably die. 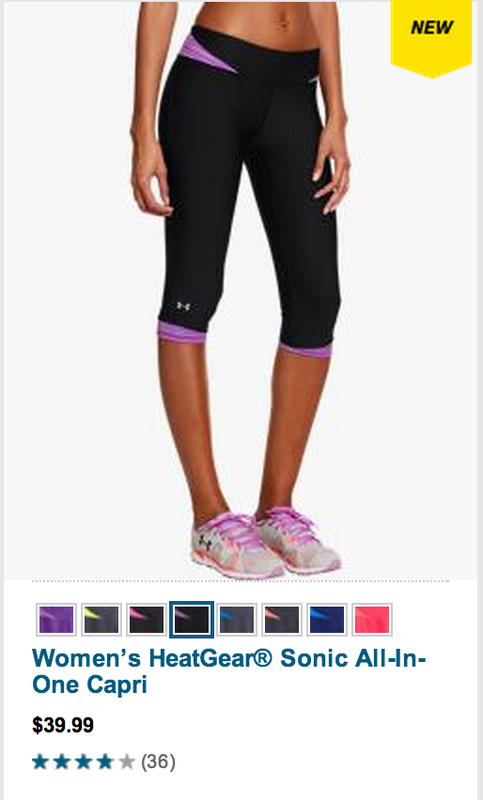 One things I must give Under Armour props for is that they design pants for girls with a little cushioning. Seriously Nike take notes. Nike pants hit my thighs and I can literally hear the fabric laughing at me. Under Armour gets my body issue where my a$$ takes up 90% of my pants and will pull them down while running if not properly contained. Thank you Under Armour! 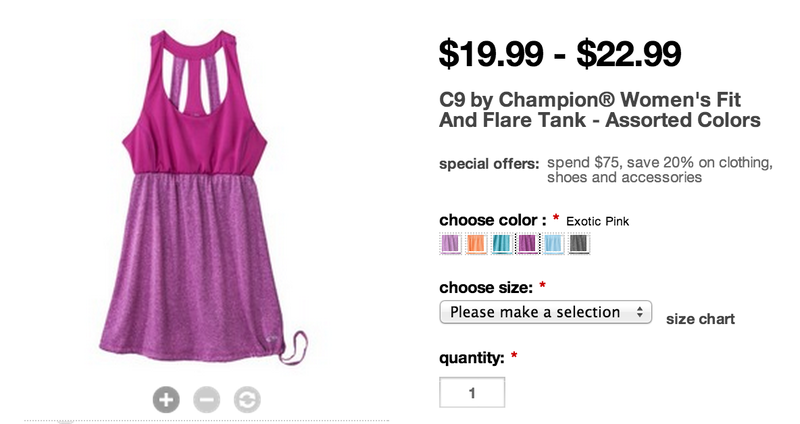 Target has some great, affordable work out gear. I like everything but their pants. I think the pants are overpriced and not that great quality. 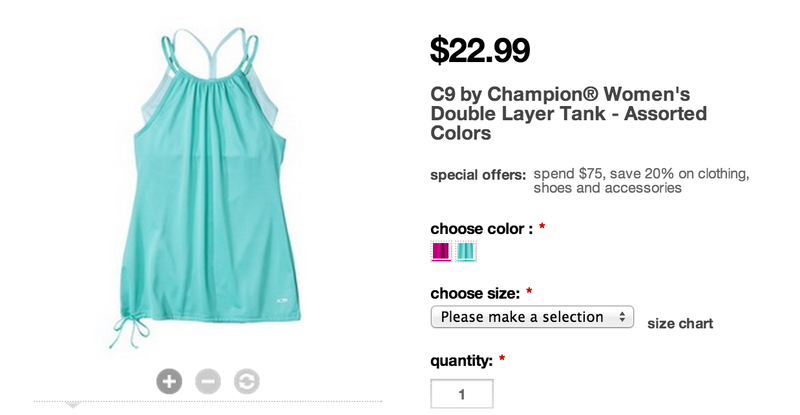 But their tops are inexpensive and last a good amount of time. I usually work out in a t-shirt but lately the t-shirt is getting annoying while working out. It’s getting in the way. I love these tops. 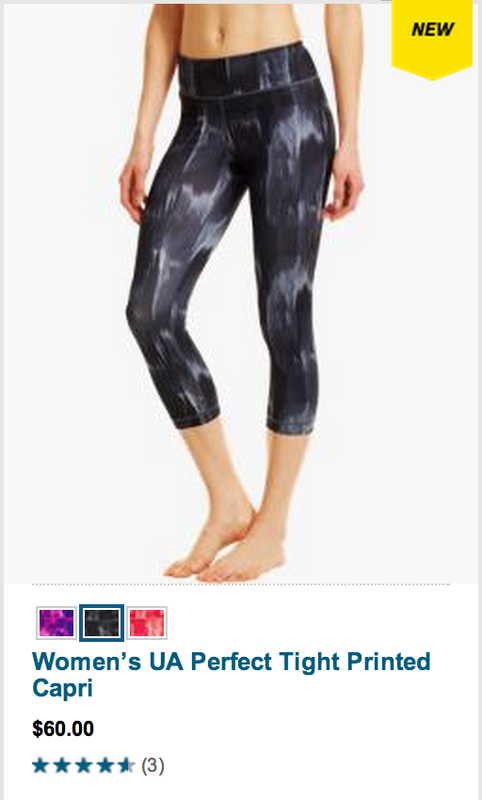 What is a work out gear post without a little lululemon? Frankly I think there’s bit too much hype around lulu but that doesn’t stop me from wanting everything they sell. 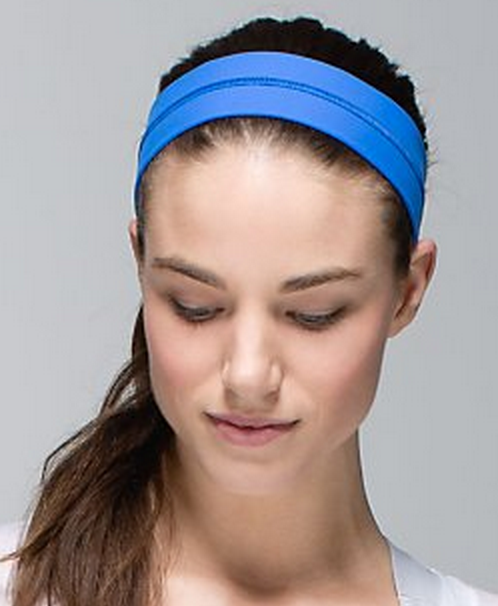 What I like most about lulu is their headbands. They are thick enough to hold back my mane without looking super gross. 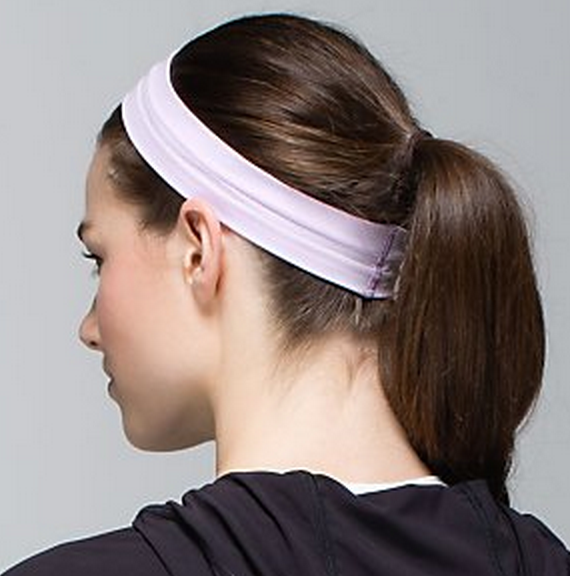 The secret is little silicone grips they put on the inside of the band to secure your hair. Good socks are the key to a good workout. Currently I’m obsessed with Balega socks. They are incredibly soft but have a good amount of compression support. There are no good pics of them online and I’m def not gonna take a pic of mine to share. But check them out. I know, I know guys I talk about these ALL THE TIME. I have yet to go try them on or buy them. It’s on the list of things to do. 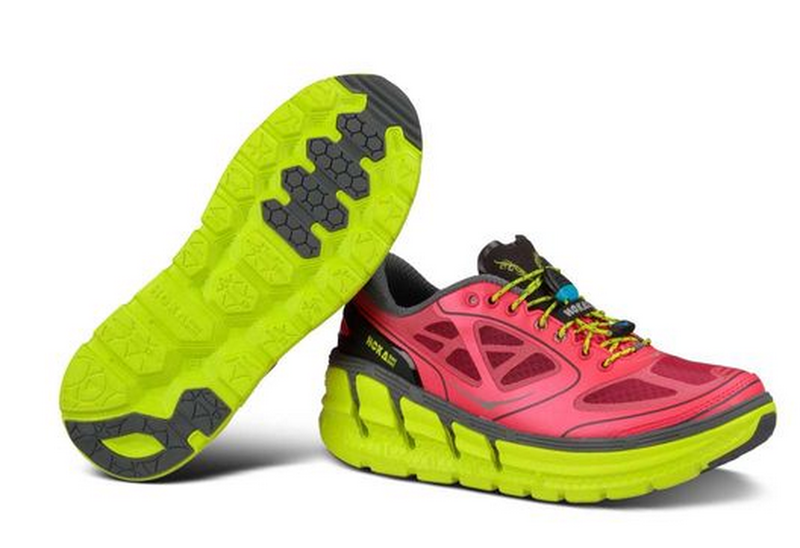 But I am SALIVATING for a pair of these. There you have it. The workout gear I’m currently drooling for. One day my prince will come who will be able to support my unhealthy obsession with spandex! I’m baaaaaaaackkk!! I hope you all missed me! Yesterday I ran Millennium Running’s Cinco De Miles 5k. I have officially renamed it to the Cinco De Death 5k. As soon as the race started, I knew I was in trouble. My legs felt like lead and every step sent a shooting pain straight to my brain. I’m pretty sure the combo of allergies, poor pre-race food, and lack of running prep lead to my lackluster performance. I finished in 39 minutes. Which is my slowest 5k to date. But hey, I finished. I’m at the point where I need to make some serious workout choices. I work out at The Training Station with my trainer Christina. We focus on a lot of weight training (suns out guns out, all day errday) but in an effort to be more budget savvy I’m going to be doing kickboxing / TRX classes 5-6 days a week. This is in an effort to save some money and also get a killer workout in every day. I’m okay working out on my own I just don’t push myself as much as I should. However, TRX / Boxing don’t mesh well with running. So I’m going to take a break. Running is killing me. My legs always hurt, I’m sore all over, and I don’t really need to seriously start training until July. So for now, I will run when I want to run and get serious about training for the 1/2 marathon come July. I still want to do the 1/2 marathon but I don’t want it to cut into my overall fitness goals. In other news I made a life plan, pulled myself out of a hole of self pity and wallowing, and once again re-motivated myself about life. Being a 20-something is rough. Between bills, finances, being a grown up, figuring out your life, and trying to exist it can be quite overwhelming. But I’m getting better at “reeling it in.” I think “reeling it in,” is my saying of the month. I’ve said it a lot lately. Now that it’s not a barren tundra outside I’m looking forward to more outdoor activities. What have you all been up to in my absence? Also any running inspiration would be greatly appreciated. Today was the first time I have run without feeling like the world was caving in around me. I knew that today’s run may be more successful than previous runs for several reasons. 1. The Fat Tuesday 5K I ran on this past week went surprisingly well. It was roughly 17 degrees outside but that had little to no effect on my run time. It was the compression socks I wore that I think I hindered me the most. While easing into the running world, I wore knee length compression socks to soothe some killer shin splints. But now that I run more regularly, I think these are hindering me during runs more than helping. For example, my feet went completely numb during the 5k on Tuesday. I could’ve run the whole thing but I was worried I’d be doing permanent damage to circulation running on numb feet. Per the advice of a fellow runner / ironman, I am going to curb the compression socks to after my runs. 2. I’ve been focusing on turning my brain off when I run. For me, running is 105% mental. Besides shin splints in the beginning, it’s my mind that’s screaming at me during every step of a run. Now I either focus on the television in front of me or constantly repeat mantras to myself while I run. This sounds insane but it actually helps me quite a bit. I’ve gone from tapping out after a mile to refusing to even stop a continuous stretch of running until I hit at least 2 miles. 3. HIIT = High Intensity Interval Training. My trainer, Christina, from The Training Station introduced me to the concept of HIIT. The theory is if you start running by doing intervals it’ll help you increase the distance you can run. This has done WONDERS for me. I started 4 months ago doing HIIT. I would run at a high speed for 2 minutes and briskly walk for 2 minutes, alternating this pattern for about 30 – 40 minutes. Another great way to get your HIIT in is through Tabata workouts. This is a 4 minute variety of HIIT. Something I also started with Christina. It will seriously kick your a$$ no matter how in shape you are. When I find myself slipping out of distance runs, I’ll go back to HIIT to get myself back on track. Seriously folks if you want to start running for distance, start with HIIT. 4. Playlists. I usually listen to DJ mixes when I run. (3LAU, Dante, Kap Slap are the top 3 DJs I jam out to right now) They get me energized to at least hit the start button on the treadmill. However, I’ve found that they almost over energize me as of late. The faster the beat of the music, the faster I feel like I should be running and exert myself. I’ve tried to seriously pick music to run to that is upbeat but not so fast paced I feel like I should be sprinting. This has also helped me to work on keeping pace. I only got involved with running because it has ALWAYS frustrated me that running is the one thing I can’t seem to master. Kickboxing, BodyPump, stairmaster, ladder drills, and just about anything besides running I can master easily. But running has always been a struggle for me. Upon watching a documentary about Pete Frates, a young man suffering from ALS, I decided that I was being a loser and should appreciate the fact that I have the ability to teach myself how to run. If you have the time, I highly recommend clicking his name and watching his story. His outlook is inspiring. So much so that it has inspired me to hopefully run a half marathon in October to raise funds for ALS research. It feels great to have finally broke through the running wall and I hope my runs only continue to get better!